As I was digging through my closets, pulling out the sweaters for the cooler temperatures, I came across a cluster of brown marmorated stink bug adults hunkering in the corner, hoping they would remain unnoticed. These insects have been creeping into many houses in the past weeks and will continue to seek out a temporary residence for the holiday season. Where did they come from and why are they invading my home? How did this pest become a pest in our gardens and homes? 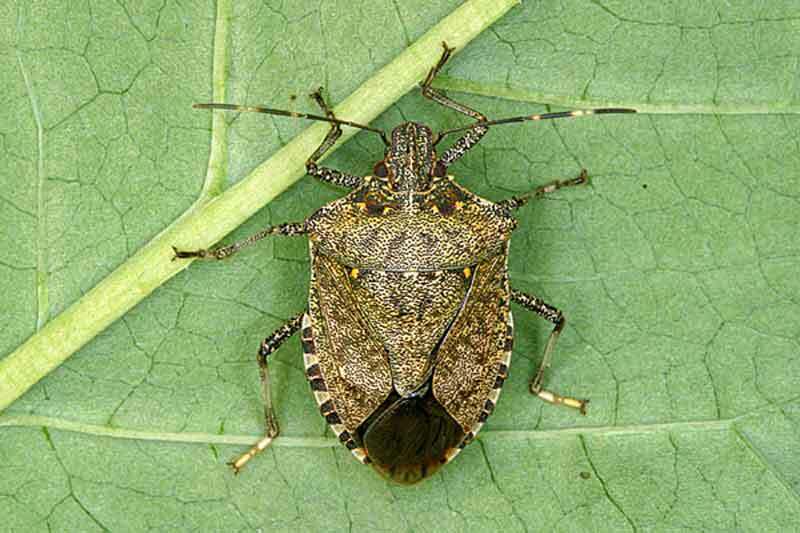 The Brown marmorated stink bug (BMSB) is an invasive species from Eastern Asia that was accidentally introduced to the United States in the 1990s and was first sighted in Forsyth County, North Carolina, in 2009. Currently, this insect pest has spread to 70 of our 100 counties in North Carolina and has been detected in 40 states within the United States. Since its arrival to the United States, the BMSB has been found on a wide variety of plants that include ornamentals, crop, and tree species, and has been more abundant in urban areas than in rural, agricultural crop fields. In North Carolina, we have several native species of stink bugs that have not become a pest problem because there are natural predators and parasites of these insects that keep their populations in check. Because the BMSB is a newly introduced species to the United States, this exotic pest is free of natural enemies and continues to populate across the state without natural control measures. Why is the BMSB invading my house and what can I do to stop it? At this time of the year, the BMSB is looking for a warm, protective area to endure the winter months, which is often why we see many of these insects invading our homes. Not only is the weather cooler, but also many plant hosts are being harvested or preparing for winter dormancy, thus, providing limited food availability to the BSMB. The BSMB will overwinter in protective structures as adults and begin to reproduce in April and early May. While their populations flourish in the summer months, they stop reproducing by late August and begin seeking winter shelter by September and October. The BMSB adults will continue to enter our homes and garden shelters, often clustering in the most hard-to-reach areas like the ceiling corners, attics, and crawl spaces. Indoor insecticide sprays have not been shown to be effective since more adults will continue to invade the home and can contaminate living areas. University entomologists across the Mid-Atlantic recommend homeowners remove adults from the home by either vacuuming or using soapy water traps. To keep BMSB out of the house in the future, check the cracks around water pipes and gaps along windows and doors. Those potential entry points can be sealed and other openings like attic ventilation areas can be protected with screen covers to prevent further insect invasions. Keep vigilant as these insects are here to stay. Throughout the winter, the BMSB will require constant vigilance. For pet owners, in my experience, dogs love to chase these insects around the house, which eventually leads to a foul-smelling odor once the insect comes to a slobbery death. As the name appropriately indicates, the BMSB belongs to the stink bug family that emit an odorous smell when alarmed. The foul-smelling chemical is not poisonous and not harmful. Neither are the BMSB adults harmful to people, pets or houses and do not sting, bite, or spread any animal diseases. They will not be reproducing during their time indoors, and will continue to invade the home, especially where exterior lights are located near home entryways. What is currently being done to manage BMSB infestations? The brown marmorated stink bug has been found to feed on a wide variety of host plants that include many ornamental and fruit sources. Because they are a relatively large insect, many home gardeners have found simply crushing adults before they begin laying eggs to be an effective control measure for susceptible crops. Natural enemies that have been documented feeding on various stages of the BMSB include: assassin bugs, earwigs, lacewing larvae, along with many bird species. At this time, insecticide sprays have not shown to be effective at controlling these pests and on-going research aims to find long-term management strategies that will not disrupt integrated pest management programs or impact non-target organisms. Entomology specialists at North Carolina State University and neighboring, collaborating universities are working together to further understand the basic biology and behavior of this newly introduced insect pest. To help their efforts, please help document the presence of BMSB in your county by completing this survey: https://harvest.cals.ncsu.edu/surveybuilder/form.cfm?testID=35847. For more information, get to know your local county extension center and the NC Plant Disease and Insect Clinic for quick resources in BMSB identification and control options. Emily Mueller, PhD Entomology, works at the Wake County Cooperative Extension office in Raleigh.